Vibrant organic red onions. One of your best friends in the kitchen – almost every meal begins with the peeling of an onion. 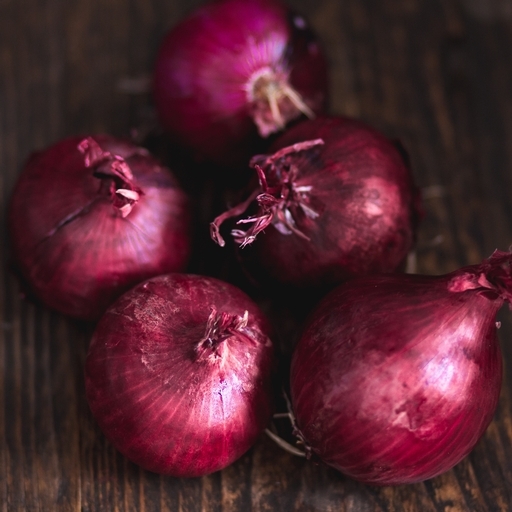 They make a brilliant base for all sorts of dishes – and because red onions are milder than white, they can be used raw to add colour and sweet kick to salads and salsas. They also caramelise beautifully when roasted. Slow-cooked red onions have a sweetness that’s welcome in everything from risottos and pasta sauces to soups and stews – or as a side to fish and meat. Cut your onions into quarters and fry until slightly coloured. Add a splash of red wine vinegar and tomato purée, a teaspoon of sugar and a few herbs – thyme, parsley or a bay leaf are all good. Cook on a very low heat for about 40 mins. We’ve tried to grow onions on our farm in Devon, but it’s far too rainy! Instead, we make use of the drier climate by using a local producer in the Netherlands.